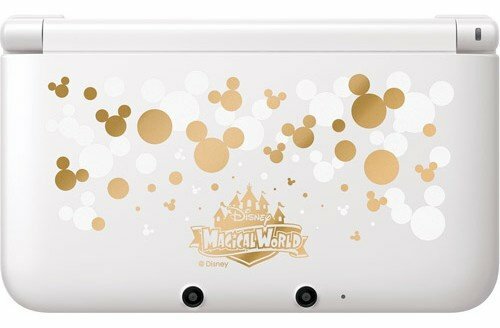 We reported yesterday that North America will be getting a special edition Mickey-themed 3DS XL on 11th April to coincide with the release of Disney Magical World. Now we know the Walmart-exclusive 3DS XL will retail for $199.96, and it will not include a copy of the game... despite the Disney Magical World logo emblazoned on its shell. The new Walmart product page for the Mickey 3DS XL also gives us a slightly closer look at the minimalist white-and-gold design, although we can't see the interior of the console. It continues Nintendo's recent trend of special edition consoles that don't include a copy of the game advertised on the box, as we saw with the Pokémon X & Y 3DS XL and the Yoshi's New Island 3DS XL. It does nevertheless, have a 4GB SD card as normal, and these models cost less than the Link Between Worlds special edition XL system that came with a download code for the game. Do you think game-less special edition consoles will become Nintendo's standard from now on? 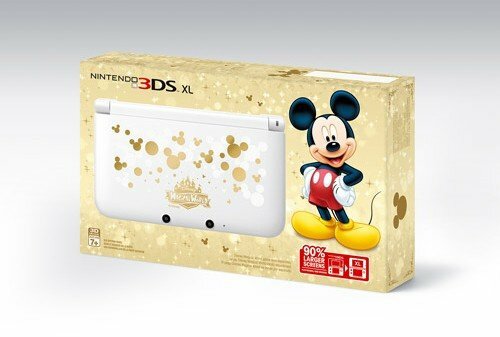 Will you be picking up a Mickey 3DS XL? Let us know in the comments. Already pre-ordered - my 9th 3DS system - really dig this pure white look - not sure if I'll buy the game - I think I will (only $30 for this one). I wonder how limited these will end up being as a Walmart exclusive system. Would be cooler without the game logo on. White and Gold design plus the two words "Limited Edition". Pre-Ordered! I love the box more than the design of the 3DS XL itself. Lol. Blech... What a boring design for such an outstanding license. I love the balloon's and everything but what I hate is the color of them. If the balloon's where different colors then I wouldn't complain. Overall its a Meh 3ds. I'm getting it. With this and the peach pink 2ds, I'll have 3ds family system number 22 and 23! I wish Nintendo of America would actually release a completely White 3DS XL or a White 2ds XL console. The 2ds XL white version could have either a green or black trim like the original 2ds have the blue and red trim on them. And I might actually pickup a 3DS XL or 2ds XL if they ever release a completely white version of them instead of what Nintendo of america offers right now only black inside of 3ds unless it is a limited edition don't care for have a design on the outside of the console like this one has or the yoshi one has. As long as the systems sell, Nintendo won't see the need to include a "free game" with it (the Zelda bundle was $20 more expensive so technically the game was not free). Not a big fan of the design, but I like that white and gold color scheme. Got some serious bling going on. @unrandomsam I'm confused. What does a DL code that cannot be traded have to do with the game ALBW bundled with the Zelda 3DS XL not being free since the bundle was like $20 more expensive than normal? @Katzii I agree.' I'm not a fan of the magical world logo. The disney castle/logo would have looked better and would have attracted a larger audience I think. I still might get this one eventually though. I also think that a gold 3DS with white balloons would have been cooler. The price is 1:1 with the normal MSRP of the regular 3DS XL units so its not bad even with the game download code. Special edition units tend to sell vary well even without the game, plus I'm sure they notice that lots of people sell off the download codes anyway. Overall pretty average design though it isn't as lackluster imo as the Mario/Luigi one or the recent Yoshi one. I would of much preferred the game logo to be on the back of the 3DS as opposed to the front. Would of looked much better imo. @darthllama MSRP is 199.99, so your saving 3 cents, lmao! I don't think it matters a great deal if it comes with a game or not. @the_truth What? It comes with the Magical World Logo on it. Common sense would dictate the game would come with the system. I don't like this new trend, Nintendo.